This particular card is all about public recognition, victory, and success. Not only have you managed to properly succeed in achieving all of your goals, but you are also being publicly acknowledged for them and the results that you ve managed to attain. You may have received an award or some sort of public acclaim. The card is indicative that you have managed to harness the strengths and talents that you have within you in an attempt to bring a particularly successful outcome in your life. 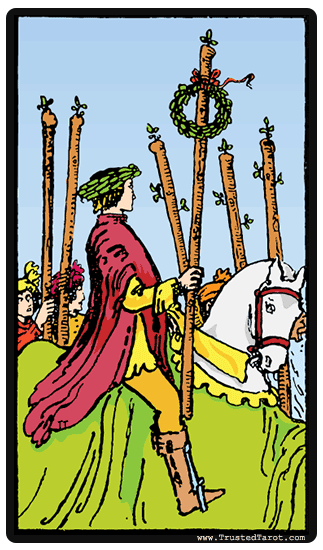 You have managed to properly get through the confusion which is brought by the card before this one – the Five of Wands, and managed to properly minimize distractions, thus successfully focusing on your goals and achieving them. The card is indicative that you have managed to harness the strengths and talents that you have within you in an attempt to bring a particularly successful outcome in your life. It s also worth noting that there is a slight downside apart from the overall positivity that stems from the card. It can bring self-importance as well as egotistical behavior and arrogance. This could make you think that nobody is better than you. When the card is reversed, this suggests that you might find yourself doubting all of your abilities as well as your overall potential to achieve any kind of success. You might be feeling particularly negative about your entire self as if you have failed others as well as yourself. This is a symbol that means that you lack the confidence and drive that you need to achieve. You need the overall support as well as recognition of third parties in order to pick you up, to emotionally provide you with some much-needed strength.